Plump, sun-ripened figs blended with juicy cassis. The warmth and exotic fragrance of the Mediterranean. Smell incredible with our nourishing and anti-oxidant rich ingredients. Made with nature's best moisturizers - Hemptons' paraben-free Body Butter is a skin must-have. Figs are treasured for their warm, tart, unique fragrance, but even more valued are the emollients that extracting oil from the seed yields and the natural humectants it contains. The Black Current seed oil added is a rich source of EFAs such as Omega 3, Omega 6 and Gamma-Linolenic Acid (GLA) which are known to soothe and improve skin resilience. Ideal for all skin types, this natural body butter absorbs easily to help keep skin soft and supple. Antioxidants, moisturizers and a lovely scent - what's not to like? 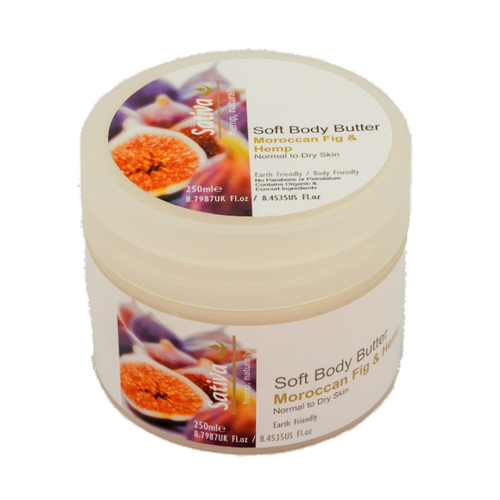 You are going to absolutely love these Body Butter!